The original version of this dish uses scrap ham. Those hams that come from Excelente in Quiapo or Adelina’s Ham are certainly the ones that garner adulation and patronage from foodies like me. However, last I checked our fridge for Adelina’s, what greeted me, in one of my food containers, was a lonesome long stick of Spanish chorizo that seemed to have begged me with the, “Eat me! eat me!” appeal. Chorizos always have that effect on me. It just makes me bite and devour it selfishly with my eyes closed. To the point of addiction. To the point of gluttony. Ah, to the point where I mechanically eat and eat and eat these chorizos some more. And, to couple it with cheddar cheese? Arg, holy cow! Deadly combination, I must say. Last week saw me dishing out this mean Spanish chorizo and cheddar cheese omelette. Used my new baby, my non-stick greenpan that’s eco-friendly and amazingly efficient. Wow, if you’re serious in your cooking, this pan is a MUST-have!!! The bed of egg from the omelette just flipped so perfectly from the pan to the serving plate! 1. Saute garlic, tomato, onion and bell pepper in oil. Add chorizos. Season with salt and pepper. Add worcestershire sauce (optional). Add cheese. 2. Mix beaten eggs and all purpose-cream together. Pour eggs on a buttered skillet to form a round bed of egg. Distribute the chorizo mixture over one half of the egg. Fold egg with the chorizo filling inside. Serve with your favorite toast. wow, this is so yummy. tnx for the recipe. i should try this! Wow! 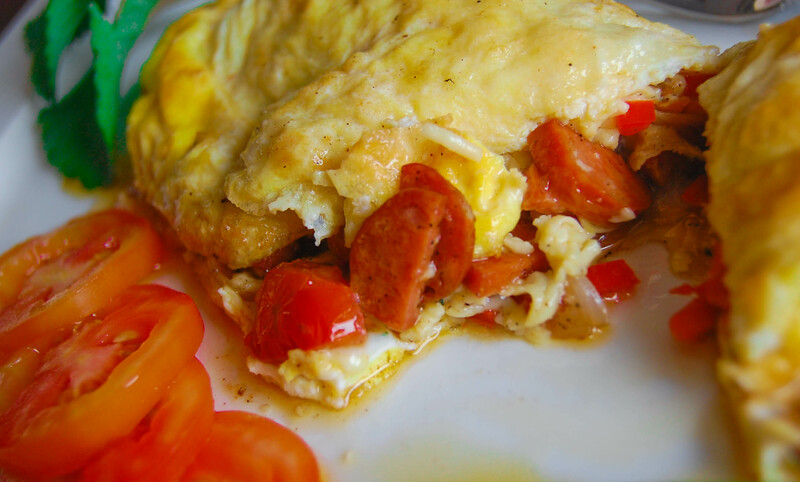 I tried cooking this chorizo omelette and my family simply loved it! Thank you and looking forward to more receipes.